Oh, the horror! Oh, the shock! Oh, the humiliation! 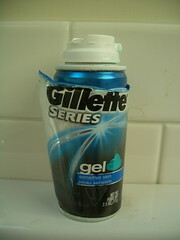 Hoping to enhance my status as a manly man, I recently purchased a travel-sized can of Gillette shaving gel. Being a discriminating consumer, I was drawn to the product by its burly packaging and subtle-yet-masculine scent. So you can imagine the dismay and distress I experienced when, after a few weeks of use, the label on the can began to peel. After the label fell off completely, the true nature of my manly can of shaving cream was revealed. Oh, the shame! Oh, the sexual confusion! My sense of identity is in tatters. UPDATE, 02 AUGUST: Thanks to the clever sleuths at Gelf Magazine, the transsexual shaving cream mystery has been officially explained. However, Gillette has yet to offer a formal apology or a generous settlement. As Telstar Logistics lawyers evaluate our legal options, I'm pleased to report that I am again feeling manly. Also, my legs are more silky smooth than ever before.